Developers tweaked the ReggieNet's layout and mobile experience, and made some common-sense updates. 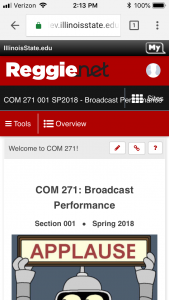 The new version of ReggieNet, Illinois State’s customized learning management system, is full of long-requested features and fixes. Whether you’re a student or an instructor, you’ll discover several new options and common-sense tweaks that make ReggieNet more intuitive to use. The recent upgrade brings the system up-to-date with the newest version of Sakai, the software “engine” that powers ReggieNet behind the scenes. In addition to working with the Sakai community of open source developers, support staff with Administrative Technologies and the Center for Teaching, Learning, and Technology worked with faculty and staff this summer to test these improvements. The update addresses some often-requested features in tools like the Gradebook and Tests & Quizzes. You’ll notice some minor changes to ReggieNet’s layout. Thinner buttons on the left-hand menu reduce the need to scroll up and down. Improved background contrast, font choices, and two-tone function buttons make elements pop and pages easier to navigate. It is now easier to manage your favorite sites list, which controls the short-cut buttons at the top of the window. In addition, new course sites can be set to automatically appear in your favorites list. Hold your phone horizontally if you encounter problems with text covering the “Sites” button. Improvements to ReggieNet’s look and feel on mobile devices received a lot praise, especially from students, in testing completed in mid-July. Now it is easier to check grades, assignments, and messages on your smartphone. Support staff at Illinois State still have one outstanding issue to resolve: Some users with small-screen phones, such as the iPhone SE, may have trouble selecting the “Sites” button to change courses. This can occur when the phone is held vertically, causing the course name to cover the “Sites” button. As a short-term work-around, you can rotate your phone horizontally to select another course. A fix for this is in the works, and this bug should be squashed before the start of the new semester. The new Commons Tool is a simple communication tool that allows students to have short conversations with their peers and their instructor. Unlike the Chat or Forums Tools, the Commons is designed as a simple chat log—no topics, threads, or grading. Gradebook: Improvements make the Gradebook far easier to navigate—the horizontal scroll bar now appears at the bottom of the screen, not the bottom of entire roster. An “Item Order” button now allows you to reorder within categories. Users may need to clear their web browser’s cache to ensure that they access the latest version of ReggieNet. It is a simple process but depends on what kind of device you are using. When filling out a ticket, please include as much specific information as you can, including the course name and section, time the incident occurred, and the device and browser you are using.